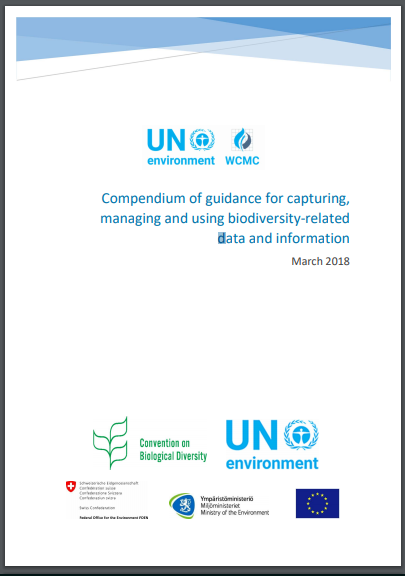 This compendium of guidance provides details of information sources for capturing, managing, using, and sharing data, all in the context of biodiversity and ecosystem services. The primary aim of this document is to assist the staff of national governments and non-governmental organisations who are responsible for the capture, management and use of data and information with respect to the biodiversity-related conventions. This compendium in particular aims to support efforts towards improving the coordination of data and information systems to help governments maximise cost effectiveness when reporting on different biodiversity-related conventions. It is anticipated that users of this guidance would have a semi-technical background and be familiar with typical environmental issues and terms. They may be familiar with capturing, managing and using data and information, but also with considering how these processes can be improved. Increased access to such guidance was called for in decision XIII/24 of the Conference of the Parties (COP) to the Convention on Biological Diversity (CBD) in key action (d) of activity B/1 in the table in Annex II. As a next step, it is intended to make this document a living document and therefore to update it when additional material becomes available and to make the identified guidance material available as interactive resources online.